Even though winter doesn&apos;t officially arrive until December 21st, the colder temperatures that are associated with the season have already made their presence felt in Charlottesville & Albemarle County. But that doesn&apos;t mean that this is a time to hibernate! In fact, it&apos;s all the more reason to get out and explore one of the region&apos;s 30+ wineries and vineyards, in an area that has received the prestigious distinction of being named one of the top wine destinations in the world! Many of these lovely wineries have inviting fireplaces, fire pits, and wood-burning ovens, perfect when accompanied by a glass of your favorite Virginia vino and the company of great friends. Let&apos;s check out 10 wineries in the Charlottesville area that feature ways you can warm up as you drink up! Located in Crozet, King Family Vineyards is a short and scenic drive from downtown Charlottesville. Nestled against the backdrop of the rolling Blue Ridge Mountains, you can&apos;t go wrong with your favorite glass of wine, the picturesque views, and of course a roaring fire in the fireplace to keep warm. Featuring gorgeous views of the mountains, vineyards, and a nearby scenic pond, it&apos;s tough to beat the setting of Pollak Vineyards. Toss in some of their award-winning wines, plus a cozy fireplace and you have a perfect recipe for a terrific afternoon in Central Virginia&apos;s wine country! First Colony Winery is located a few miles south of downtown Charlottesville amidst the pastoral and gently rolling hills of rural Albemarle County. Sip on a glass of wine by the wood-burning stove and be sure to keep an eye out for Fritz, First Colony&apos;s own winery cat, who just might pay you a visit - or be curled up asleep by the fire! A day like today just calls for Thatch by the fire... And conveniently, we have the fire going and our holiday Thatch special running (buy two or more get 25% off)! We&apos;re open until 6pm tonight. Grace Estate Winery is a charming vineyard located in Crozet and it&apos;s home to some simply succulent wines! In the winter time, you can find guests getting warm and cozy by the fire, as they sip on their vino of choice, all while enjoying the beautiful scenery of Albemarle County. Located in the eastern portion of Albemarle County, Keswick Vineyards sits in a landscape full of rolling hills and stately horse farms. Visitors come to Keswick Vineyards to enjoy the award-winning wines and in the winter, to sit by the fire, and possibly enjoy some snuggles from Mittens the winery cat! Pippin Hill Farm & Vineyard has some of the most breathtaking scenery of any winery in the Charlottesville area. Plus, there are plenty of spots to have your tasting and stay warm at the same time! When the weather is on the cold side, simply throw on a coat and head outside to keep warm by a roaring fire pit, as you sip their fine wines and enjoy the absolutely epic views! Barboursville Vineyards has been producing iconic and award-winning wines for decades and welcomes plenty of eager visitors to its tasting room each and every week. Rest assured in the winter time, there will be a roaring fire going in the fireplace to keep you warm as you enjoy your favorite Virginia wine at this legendary Central Virginia winery. Veritas Vineyard & Winery is another favorite winery of wine aficionados far and wide. Located a short, 30-minute drive from downtown Charlottesville, this winery has an incredibly beautiful tasting room, with a large fireplace sure to keep guests nice and toasty on even the coldest of winter days! White Hall Vineyards is located in the western part of Albemarle County, a relatively short, but breathtaking drive from Charlottesville. The wines here are top notch, as is the scenery. 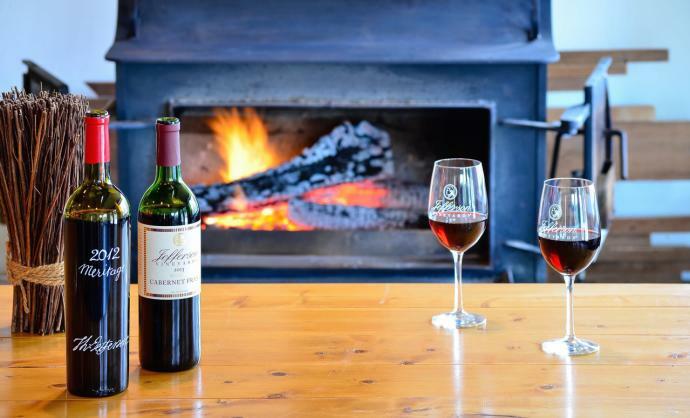 On a cold, wintry day, you can count on a fire in the fireplace, which will pair just perfectly with a glass of one of their many delicious and award-winning wines. Last (but certainly not least) on our list of cozy wineries to visit in the winter time is a winery bearing the name of the man who envisioned Central Virginia as a landscape teeming with vineyards and grapevines - none other than Thomas Jefferson! Located just a few miles from Jefferson&apos;s historic Monticello, Jefferson Vineyards is a wonderful place to visit year round. 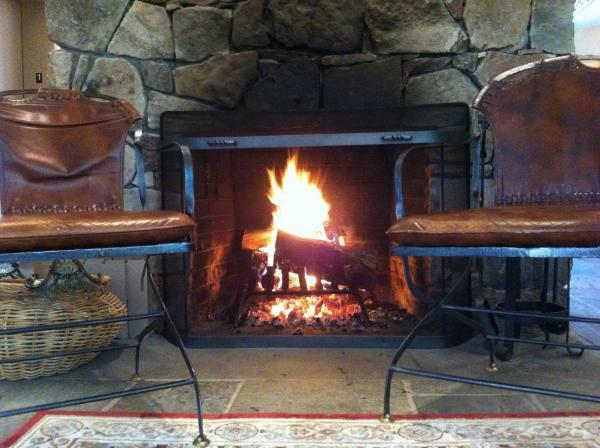 But in the winter time, it&apos;s the perfect place to escape the cold and snow with a glass of wine by the fire. Pair it up with some cheese, crackers, and meats, and you can bet this is a plan that would undoubtedly get Mr. Jefferson&apos;s seal of approval. 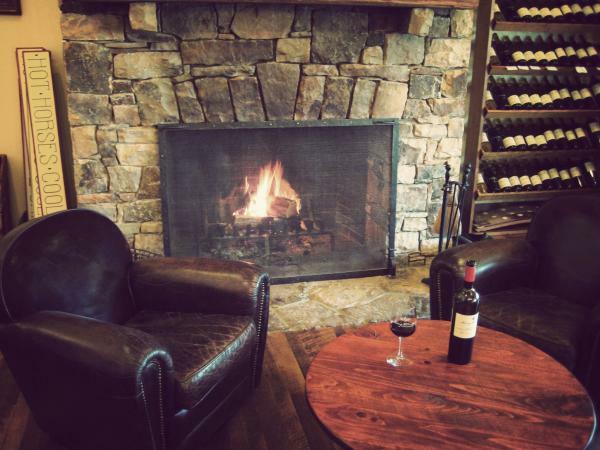 While this list features many of the wineries in the area that contain fireplaces or fire pits, it only scratches the surface of ways to stay warm and cozy in the Charlottesville area this winter. Be sure to browse our website and calendar of events for more suggestions, events, and things to do. Plus, keep your eye out for more upcoming articles containing great winter vacation ideas in Charlottesville & Albemarle County!